← Severe Weather Risk on Wednesday. How much of a Risk? Severe Weather Threat on Wednesday in Florida. When will it arrive at your front door? The first tornado watches have been issued in the central and southern plains and there have already been reports of some severe hail and winds of 70 mph. A moderate risk has been issued from northwest Texas to the southern Ohio River valley. Over the last few weeks, those of us in Florida have become accustomed to watching the regional radar wondering if it is going to take 3 days or a week to get the next frontal system through our area. This time, there is some push behind the front with some cold air. 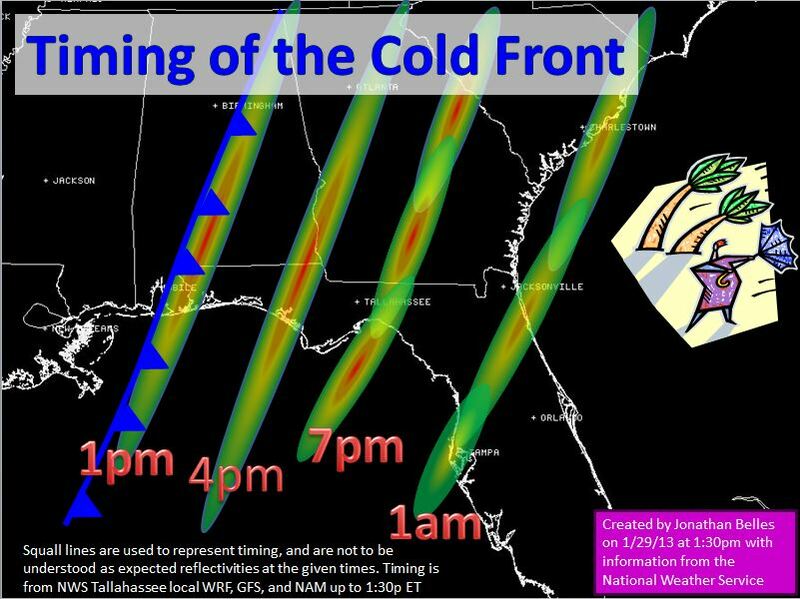 In fact, this cold front will be sliding through parts of Florida at this time tomorrow. The biggest feature that is helping the chances for severe weather is the amount of wind in the mid to upper levels of the atmosphere, and the shear that is associated with it. Such wind may make it to the ground as the cold front pushes through. Currently, the models are forecasting winds of 60-80 mph just a few thousand feet off the ground. With any sort of mixing, such as mixing that occurs in strong thunderstorms, those winds could be brought down toward the ground. I think that the largest impacts here in Florida will be from the wind. There is a chance of a pop up tornado by mid day mainly to the west and north of Dothan, AL. As with most squall lines in January, most of the energy associated with this low pressure system will be lifting northward as the system rolls through. The slight risk is illustrated below inside the solid goldenrod lines. The best risk of severe weather is in eastern Alabama and in northern Georgia. My current thinking on the timing of the squall line is as below. This is based on a blend of local models, the NAM, and GFS. 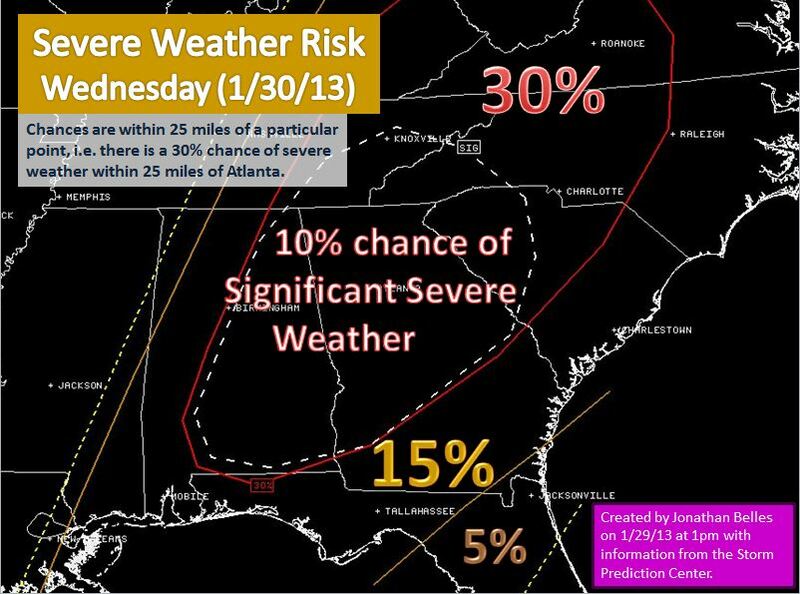 Posted on Tuesday, January 29th, 2013, in Florida Weather, Severe Weather. Bookmark the permalink. Leave a comment.